Evidence suggest that Jews lived in Biloxi by 1855, but no organized congregation until after World War II. Observing the disconnected Jewish population of the Gulf Coast region, Max Signoff of Hattiesburg came to Biloxi and inspired them to establish a B’nai Brith Lodge. The lodge was founded in 1953, which began the movement towards finding a building to house the town’s growing Jewish population. Before they acquired their own synagogue in 1958, Jews of Biloxi observed Friday night services at Keesler Air Force Base, where there were often Jewish chaplains to lead them in worship. 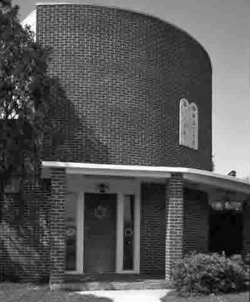 In the 1950s, Rubin Goldin, Jack Goldin, Abe Herman, Dave Rosenblum, and Moody Grishman led the community’s effort to find a suitable building to house their congregation and support their newfound Jewish solidarity. At one point in the process, they purchased a plot of land, but they had to resell the property when their finances fell short. Moody Grishman saw and seized a new opportunity for a synagogue in 1958. After one of the large homes of Biloxi had been devastated by a fire, its owner offered to sell the property for only $8,000. Though the building had been thoroughly damaged, $6,000 transformed it into a functional building, which was named the Jewish Community Center of Congregation Beth Israel. Officers of the Congregation were: Abraham H. Silver, president; Rubin Goldin, vice-president; Gerald Piltz, treasurer; and Bernard Horn, secretary. Trustees were: George Altbach; James Rosenblum; Zondel Katz; and Earl Friedman. In order to accommodate varying religious backgrounds, the bylaws of the Congregation provided that the worship services would follow Conservative Judaism, making it the only Conservative synagogue in the state of Mississippi. Nearly all the Jews in Biloxi contributed labor and/or finances to the project. Arthur Nathanson and his mother, Mrs. Ethel Nathanson of Chicago, worked together to arrange the donation of a Torah scroll and ark by their Chicago congregation Rabbi Charles Mantinband of Hattiesburg led services at the synagogue’s dedication. There were reportedly 200 people in attendance, including people from New Orleans and Hattiesburg. After its initial rehabilitation, an additional wing was built in the early 1960’s for a larger sanctuary. Sunday school classes, organized by the Sisterhood. The fact that the Jews of Biloxi called their building a Jewish Community Center rather than simply a synagogue reflects their desire to cater to all the needs of the Jewish community under a single roof. Prior to construction of the building, the Jewish community of the Mississippi Gulf Coast had been isolated and disjointed. Jews in coastal towns were often ignorant of the existence of other Jewish families in their area. The building was designed to address that issue by creating social and community bonds which would bring the Jewish community together as both co-religionists and as neighbors. In the early days of the Community Center, they even hoped to build a swimming pool and tennis courts to help the children to socialize with one another. The strength of the Biloxi community was tested in August of 2005 when Hurricane Katrina severely damaged their synagogue, which is located only a few blocks from the coast. After much thought and discussion, the congregation decided to build a new synagogue on a new site in Gulfport far from the coast. After the storm, the congregation initially held services in the chapel at Keesler Air Force Base. 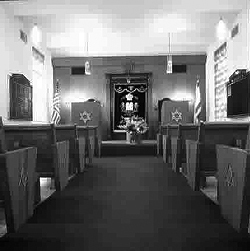 Though the loss of their shul was devastating, some old members felt nostalgic when they entered the Keesler chapel for the high holidays in 2005. It was here that the congregation first prayed together. Eventually, they were invited by the Beauvoir United Methodist Church to use their building for Friday night services. Though Beth Israel never employed a full-time rabbi, the congregation continued regular shabbat and holiday services under lay leadership for almost fifty years in the original synagogue on the northwest corner of Southern Avenue and Camellia Street. The congregation has benefited over the years from Jewish chaplains at Keesler Air Force Base, and more recently, from visiting student rabbis arranged through United Synagogue of Conservative Judaism and the Jewish Theological Seminary in New York City. The strength of the Biloxi community was tested in August of 2005 when Hurricane Katrina severely damaged their synagogue, which was located only a couple blocks from the beach. After much thought and discussion, the congregation voted to rebuild on a new site in Gulfport north of Interstate 10. After the storm, the congregation initially held services in a non-denominational chapel at Keesler Air Force Base. Though the loss of their temple was devastating, some old members felt nostalgic when they entered the Keesler chapel for the high holidays in 2005.It was here at Keesler that the congregation had first prayed together. Beauvoir United Methodist Church, under the leadership of Rev. Marilyn Perrine, invited the congregation to use their social hall for Friday night services and Jewish services and events were held there for nearly four years, until a new synagogue was completed. 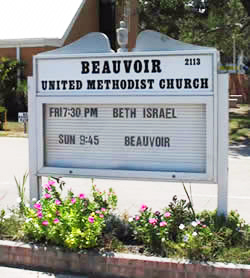 In May, 2009, Beth Israel dedicated its new synagogue in Gulfport on Shavuot, the Jewish festival which celebrates the Jews receiving the Ten Commandments. The Jewish community in Biloxi has been an integral part of the Mississippi Gulf Coast's renewal since the 2005 hurricane.